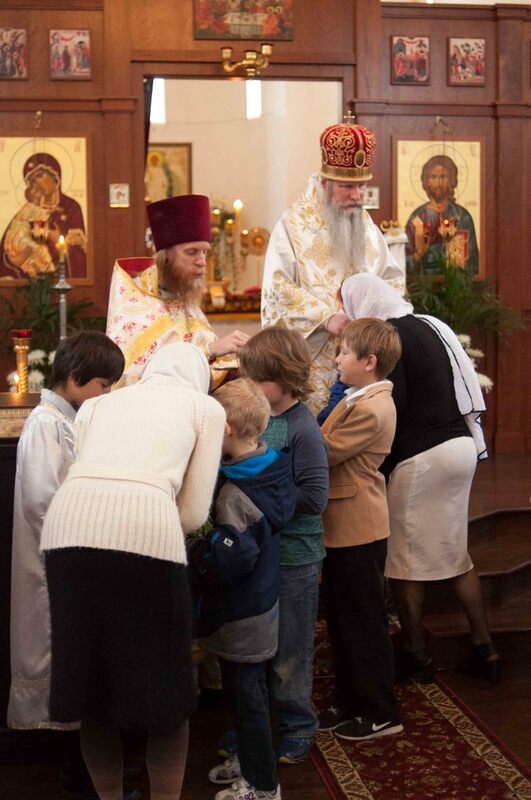 On Friday, May 6, St. George Russian Orthodox Church celebrated their patronal feast with a liturgy. It was the tenth such festal liturgy since the parish’s founding in the fall of 2005. Archpriest Michael van Opstall celebrated the liturgy together with five of his brother priests: Northern Deanery Dean and rector of St. Nicholas Cathedral in Seattle, WA, Archpriest Alexei Kotar, the rector of St. Seraphim Orthodox Church in Boise, ID, Archpriest David Moser, Priest Gregory Horton, rector of Holy Myrrhbearers Orthodox Church (Antiochian) in Bonners Ferry, ID, and Priests Justin Havens and John Mahfouz of SS Peter and Paul (Antiochian) in Salt Lake City, UT. 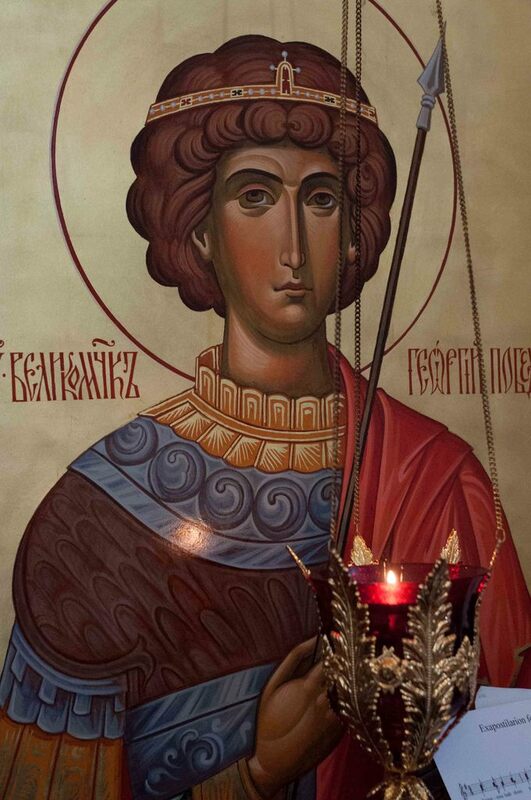 Many of the area faithful joined the parishioners of St. George in celebrating their patronal feast day. 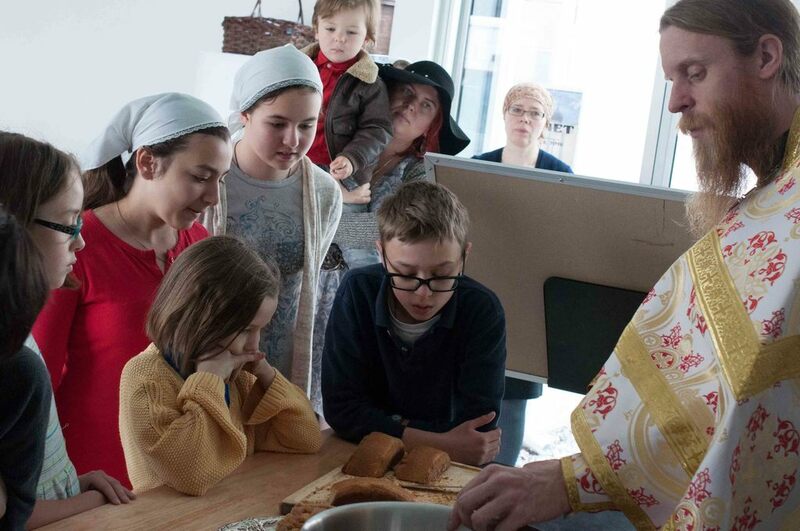 Afterwards everyone gathered at the home of longtime parishioners Irina and Gleb Romanovsky to celebrate with feasting and activities for the children. Bright Saturday found Fr. Michael and the children of the parish again in church for the last liturgy of Bright Week. The older boys served with Fr. 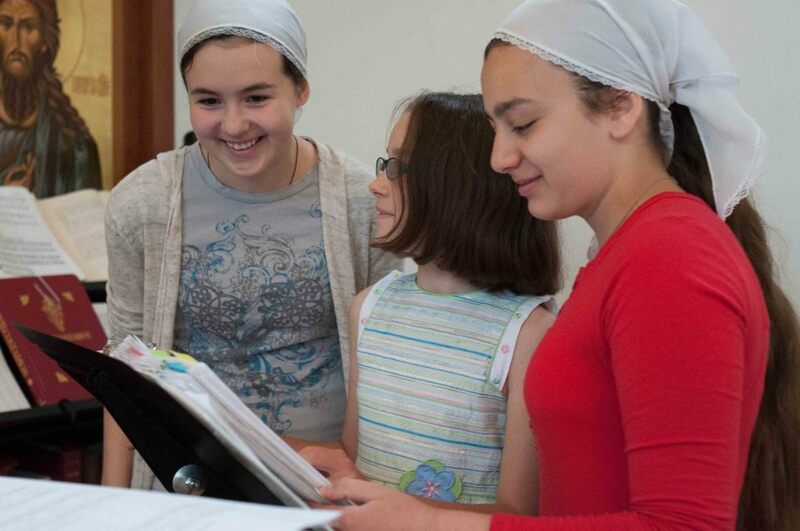 Michael in the altar and read the epistle while the older girls sang the all the hymns and responses by themselves. 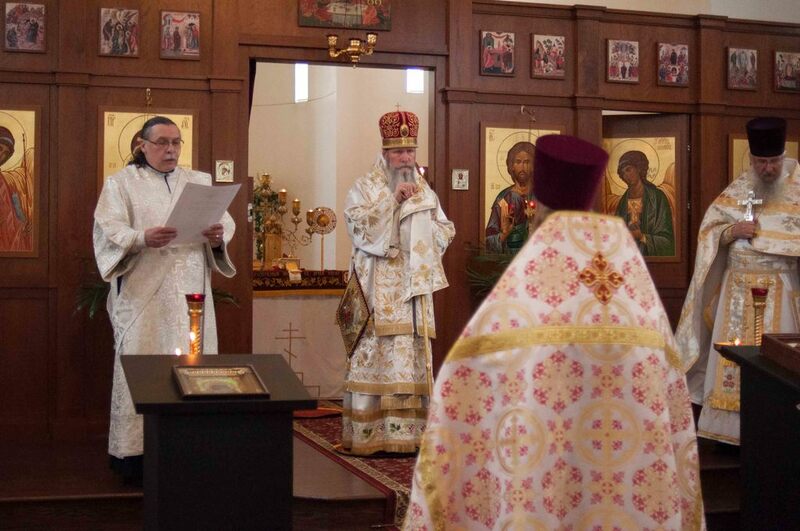 The capstone the festal weekend was the arrival of His Eminence Kyrill Archbishop of San Francisco and Western America for the celebration of Thomas Sunday services. 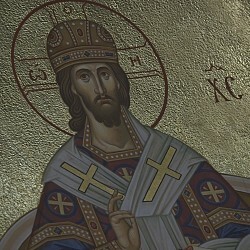 Archpriest Alexei Kotar, Protodeacon Paul Bilibin, and Hierodeacon Peter (Karakozoff) joined Fr. 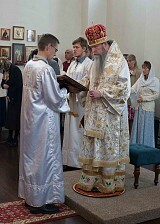 Michael and Vladika Kyrill in serving both the All-Night Vigil and the Divine Liturgy the following morning. The number of communicants at the Divine Liturgy was so great that two chalices were needed in order to accommodate all the faithful. 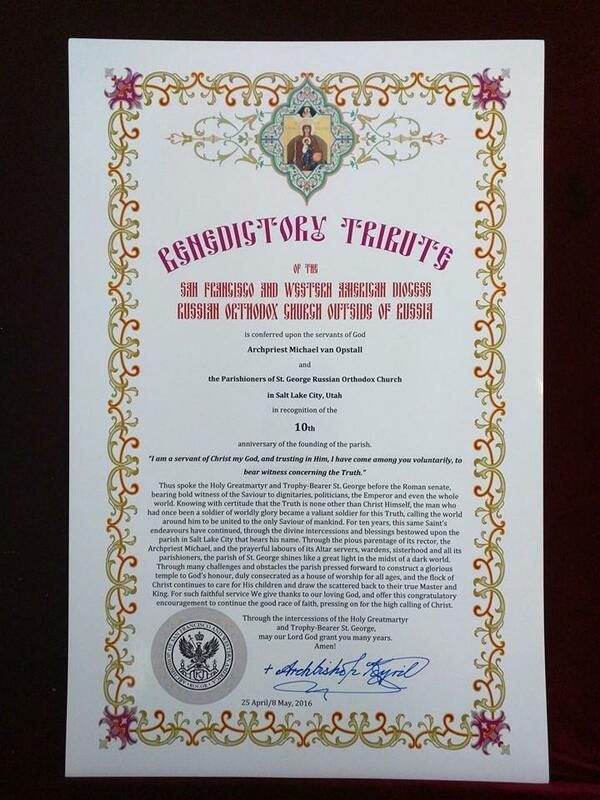 At the conclusion of the Divine Liturgy His Eminence Archbishop Krill presented the parish with a Benedictory Tribute for their endeavors in founding and serving the parish for the last ten years. Following the liturgy the clergy and parishioners departed for a celebratory banquet hosted at the nearby West Jordan event center where everyone enjoyed a delicious repast and a slideshow highlighting the parish’s development over the last ten years.